Home Look for less A story to tell..
Hi readers, today’s post is not just another outfit or styling idea. I’m going to tell you a little story about my life 7 and half years ago. Just after the birth of my first daughter and only recently having migrated to Australia I faced considerable challenges. At first I was sure it was my anxious nature mixed with the uncertainty of being a first time mother. I sorely missed my family and having people around especially with the demanding job of looking after a new born. The pressure of managing an infant with unpredictable patterns was too much to handle for my compulsive planning mind! I loved my baby intensely beyond a doubt but felt helpless when she was glued to me 24 x 7. At the same time I felt pangs of guilt for not being able to enjoy my baby completely. I was supposed to be happy but I wasn’t! Luckily with all the help available in this country my husband and I identified that I was suffering from Post natal depression (PND). Accepting this was the first positive step we took. I began weekly therapy sessions after hubby convinced me that I had to get out of the house and I would be able to manage it fine with the baby. I must admit it was the best thing we did at the time. The therapy had the perfect healing touch. The me-time, meeting other mums with PND and the wonderful therapists all worked magically for me and gave me new found confidence and ability to cope with difficulties and the guilt too! 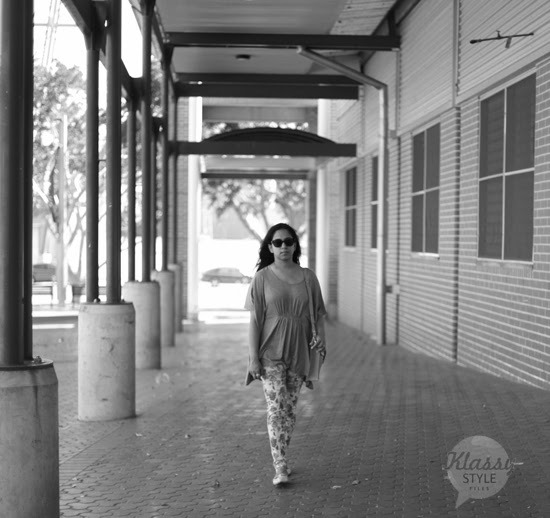 Its interesting that this outfit’s been inspired by one of my favorite fashionistas and mother to an adorable toddler! See Miranda’s chic effortless style below and hop on to Polyvore for more if you love her look! This post is like a note to myself and all you young mothers out there to stay inspired, share your story and indulge in a celebrity look..you don’t necessarily have to be a super model! It’s not that hard to find joy in the small things and remember to reward yourself every now and then…. PANDA, the Post and Ante Natal Depression Association, are the only national organisation in Australia that raises awareness of depression and anxiety during pregnancy and after birth and provide ongoing support services to families to assist in their recovery. True, there is very little awareness regarding PND, especially in India. A support group is considered the best solution, and I’m glad you found one!! The outfit is lovely, you are really glowing! Thanks Fab! Yes the support group was miraculously healing! OMG I went through the same after my first baby….I felt sick for feeling sick and could not understand for the life of me, how women enjoyed their time as new moms so much..
2nd time was much easier. Love those pants. And the shoes are so cute. I didnt know about PND. Thanks for sharing. Now I know. Thanks Rupa..yes, the idea was to spread awareness for PND.. I was recently reading about PND in a magazine, and thought the figures given were incorrect ! Now I feel, it might be true. Good you got over the stage, am happy for you. Thanks Surbhi! PND is more widespread than we think and the idea of sharing was for women to accept their feelings openly without guilt..
You look fabulous and this is one of my favorite look of Miranda’s. I love your flats! Have a great day, Kalyani! Glad u know u fought ur depression. i love those floral pants, still making my mind to buy one. You are fighter and you came up sooo well with your depression!! This outfit is awesome of yours is awesome I liked everything!! 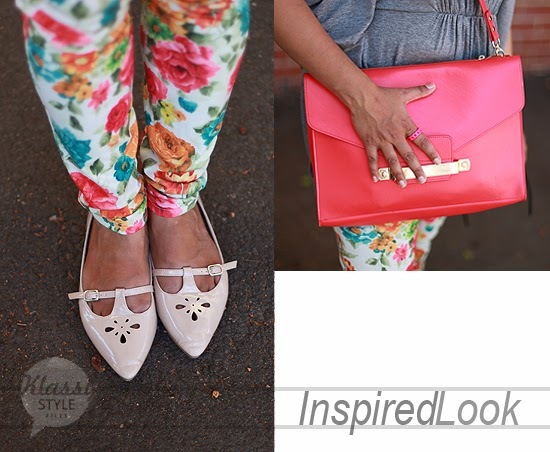 Lovely outfit…..I know you are a real fighter…Love to read your blogs kalyani…. As for the outfit, love it! 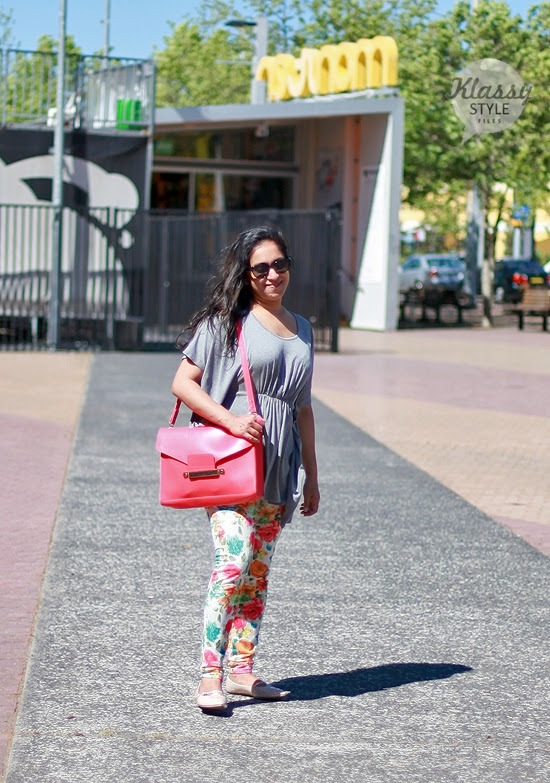 The printed pants and the bag are delicious! cute outfit! I really love your bag! Thanks my dear readers for your feedback on this post. It is very encouraging! thanks for sharing your PND experience…yes we need to recognize it and treat it!! I have seen one case where one of my father’s friend’s daughter suffered from really bad PND during both her pregnancies in USA, she was lucky to have her mother first time around and recovered but second time, it took a toll on her …and she just went down the path..so much so her whole family life is in shatters now!! A supportive husband & family ..and most importantly casting off the taboos in our minds is required!! 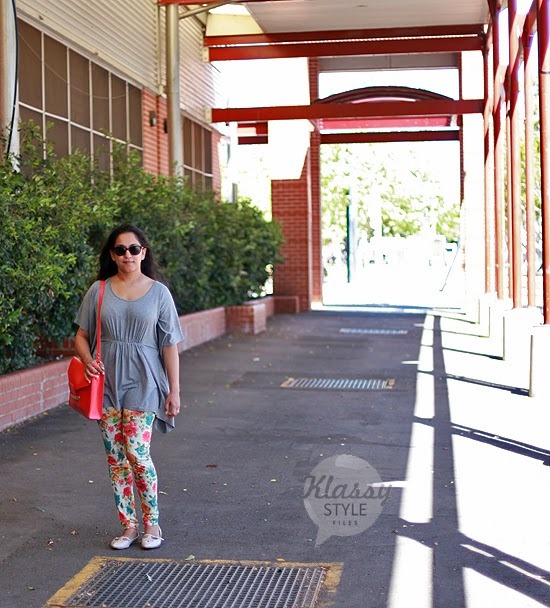 Love the way you look, perfect spring time outfit…..will try this in spring in Delhi!! now toh we are trying on layers for winters!! So glad you fought it. You are definitely strong girl. It was inspiring to read your story. Must say you did that look very well because I love everything about it. From the shoes to the pants to the hair! Lovely.